When listening to the Allen Ginsberg soundbites on this site please play them through twice for optimum sound reproduction. Recorded at the Q and A at Heaven nightclub on the date of the reading. If they do not play in Internet Explorer, please use Firefox browser. Allen Ginsberg DVD FILM released June 2005. Instructions of how to order from this website and available from all good DVD shops in the UK and online. and we will send you Allen Ginsberg Live in London by return. Please allow 7 days for delivery of the dvd. Please note this DVD FILM is cheaper to order direct by mail-order than through the shops. This film footage will play on all dvd players and computers with dvd play software including NTSC dvd players - rated DVD 0. Camera/Producer Steve Teers - Diva Pictures Ltd., London. Many thanks: TOM PICKARD for his assistance with Allen Ginsberg's reading. With many thanks to Lee Harris of Alchemy, Portobello Rd. London, who booked Allen Ginsberg for the event, without whom this DVD would not have happened. Thanks to Heaven nightclub crew and club crew. DVD FILM of Allen Ginsberg performing his poetry live on stage, in London on October 19 1995. ALLEN GINSBERG LIVE IN LONDON Many thanks to The Allen Ginsberg Project, The Wylie Agency (UK) Ltd, Lee Harris and the photographers. There are some Allen Ginsberg soundbites on the site which it is best to play on broadband. For ordering instructions of the DVD film please see the information to the left/below. For an index of this site please go to the index box on the top right of this page. 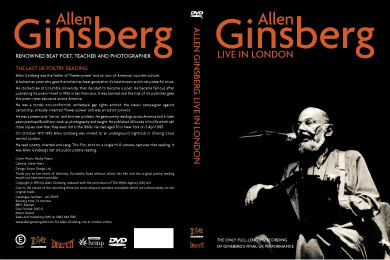 Filmed at London's Heaven nightclub, this DVD film 'Allen Ginsberg live in London' is a film of celebrated Beat poet and co-founder of the Beat generation Allen Ginsberg, performing his poems, live on stage in London, from thursday October 19 1995 (at the megatripolis club-night). It is a 53 minute archive dvd film of Allen Ginsberg's full live stage performance. Allen Ginsberg, Beat poet, co-founder of the Beat generation, civil rights campaigner, Buddhist, father of 'flower-power', teacher, photographer, musician and icon of American culture, performed his poems on the main stage of subterranean 'Heaven' nightclub, London, to an audience of around 1000 people. In the performance, Ginsberg performs a variety of his work, assisted on stage by the UK poet Tom Pickard, turning pages. Included in the reading are a Tibetan meditation, several songs and classic poems such as as 'Hum Bom!, 'Elephant in the Meditation Hall', 'Proclamation! ', 'Fifth Internationale' as well as 'American Sentences'. Ginsberg reads, chants and sings, occasionally accompanying himself on his harmonium, in a reading full of energy, wit and candour. He read his works from the 1970's White Shroud era to 80's Cosmopolitan Greetings and 90's new and unpublished poetry, demonstrating his great virtuosity, as a performer of countless poetry readings across the world. The venue was lit with theatrical lighting, psychedelic backdrops hanging around the walls and from the ceilings, lending an intimate atmosphere to proceedings. He occupied the main stage, seated in front of a single microphone and music stand, dressed in a blue shirt, red braces and grey slacks. He had travelled from the Royal Albert Hall the previous evening, where he had been taking part in 'The Dialectics of Liberation' (a poetry reading celebrating the great poetry meet there from June 1965 - an event which had kick-started the 60's in earnest in the UK). Through the reading, he talked with the crowd, sharing anecdotes from his life, often while introducing his poetry. He played harmonium and song sticks on poems such as 'Put Down Your Cigarette Rag'. The audience, seated across the huge dancefloor and occupying every conceivable balcony and space in the venue, added to the atmosphere of the evening, applauding, joining in, laughing and enjoying his conversation and performance. He performed superbly, an expert interpreter of his work. Giving the poems great meaning with amazing energy. At the end of the reading, which was sadly to be his final stage reading in the UK, he led the crowd in a singalong of 'The Nurse's Song' (by William Blake) until 1000 people were singing ''And all the hills echoed'', over and over. A long standing ovation ended the performance. This is a little promo site for the DVD film. On the site are a few poems, photos and quotes, used with permission. This DVD archive film is of the full stage performance, lasting 53 minutes. There are no extras on the DVD. For 2 clips of 'Allen Ginsberg live in London' please see below - (please note the quality of the youtube clips is inferior to that of the DVD). This DVD is available to buy by button purchase above with credit card or paypal or from amazon.co.uk below or by mail-order (priced at #10 pounds GBP / 13 Euros / $15 US including p+p). This DVD film plays on all DVD players and DVD readers rated DVD 0. This DVD film has been officially released. Famous American Beat poet, teacher and photographer. Irwin Allen Ginsberg was born on June 3rd 1926 in New Jersey, of Russian jews who were both first-generation Americans. His father Louis was a poet and school-teacher who moved in Greenwich village circles after the first world war. His mother Naomi, was an articulate Marxist and a naturist that went mad. His elder brother used to write poetry and was published however it was William Carlos Williams, his father's friend and fellow school-teacher that encouraged Allen Ginsberg to write poetry. After attending Montclair State College, Paterson, New Jersey, Allen Ginsberg obtained a scholarship which took him to the Ivy League Columbia University in New York. There he met Jack Kerouac and William Burroughs and they became friends. The three were eager to develop American writing not in an all-pervasive Hemingway style but along the lines of Walt Whitman, Herman Melville and Thomas Wolfe, the author of 'Look Homeward Angel', who died in 1938. The theory that they adopted was that it did not matter how much drink and drugs they took at night so long as they were at their desks in the morning. A lot of their influence came from the free jazz scene in New York. In 1948 Allen Ginsberg was arrested after some acquaintances had used his flat as a base for a robbery. He only escaped prison because his family committed him to a mental hospital. The headlines of the local paper read 'Genius Columbia Student, Master of Crime Ring'. The insanity which he encountered in the asylum found it's way into his first published poem 'Howl'. After qualifying he then worked in an advertising agency in New York, the yuppie ideal and as a market researcher in San Francisco. He held no hopes that his poems would ever be published partly because he did not want his father to discover he was homosexual. For a time he lived with a woman and even thought of marrying. 'Ginsberg read on to the end of the poem, which left us standing in wonder, or cheering and wondering, but knowing at the deepest level, that a barrier had been broken, that a human voice had been hurled against the harsh wall of America and it's supporting armies and navies and academies'. Lawrence Ferlinghetti, owner of City Lights bookstore was there. He approached Ginsberg to publish him apparently with the famous lines ' I greet you at the beginning of a great career - when do I get the manuscript? '. This was no gaurentee of success and Allen Ginsberg had little hope. He joined the merchant navy and sailed for the Arctic Circle. Lawrence Ferlinghetti published the poem 'Howl' on November 1st 1956. It was received tumultuously and then banned by the San Francisco police. Like T.S. Eliot, Ezra Pound and Robert Frost, Allen Ginsberg was first published in England. At New College, Corso's poem 'Bomb' with the lines 'O Bomb I love you, I want to kiss your clank, eat your boom...' had provoked members of the college poetry society into hurling their shoes at the poets. W.H. Auden later defended Allen, observing that 'Howl' had much to say and that Allen Ginsberg 'may well grow to even larger achievements'. In 1957 the poem was finally published in America after the ban which had given it much publicity and the book 'Howl and Other poems' became a best-seller, a bible for a beatnik youth. Ginsberg became a celebrity and his photo appeared in 'Life' magazine. However he was not seeking publicity. He acted as an unpaid agent for both Jack Kerouac and William Burroughs. He was also responsible for Jack Kerouac's novel, 'On the Road' being published in New York in 1959. He went to live quietly in Paris for a year and a half. In the 1960's the beats turned into the hippies. Ginsberg embraced the new culture, unlike Kerouac and Burroughs. He steeped himself in eastern mysticism and read his poems on stage with Bob Dylan in oriental robes and a big bushy beard. He was given star treatment wherever he went. He became a guru of the new youth culture and coined the slogan 'flower-power'. He was also an intrepid traveller. He journeyed into the jungles of Central and South America in search of drugs. He lived for some time in India among the very poor studying eastern mysticism, long before it was fashionable. The Indian government thought he was an American spy and expelled him. He was also well ahead of the Washington Post in discovering that the CIA was running drugs out of Cambodia. In 1964 he introduced Ken Kesey, in his famous 1939 International bus 'Furthur' with Neal Cassady at the wheel, to Timothy Leary at Millbrook, the other great early LSD experimenter. He became something of an institution, renowned for such declarations as ' poetry is best read naked '. At one point he spent some time learning to dance like a kangaroo from an aboriginal instructor. He stripped naked at poetry readings and attended political protests. He accompanied Bob Dylan to England on his 'Don't Look Back' tour. He became something of a protester 'par excellence'. The FBI accumulated a huge file of mostly trivial information about Ginsberg's views and movements ('The Beat Generation is an accusation of the system', states one memo with thudding insight, while another describes him as 'an entertainer with a fuzzy beard who chants unintelligible poems'). In 1965, he was thrown out of Cuba for a combination of offences against free speech and sexual mores and in the same year was deported from Czechoslavakia. Students had elected him the King of the May in Prague. A crowd of 100,000 saw him chaired through the streets but the intervention of a party official with the police behind him prevented him being crowned and given the 'freedom of the city'. Plain clothes police attacked him with clubs and he was expelled as an undesirable. He wrote 'Kral Majales' on the plane to Britain immediately afterwards. Twenty-five years later he returned to Prague - and President Vaclev Havel gave him the May King crown again. In London in 1965 he performed at the Royal Albert Hall at the International Poetry Reading . Thousands of people turned up to watch a host of poets perform for what was to become a seminal event in sixties Britain. Ginsberg was the headliner and bowled the audience over with a breathtaking performance, transmitting electrically, a non-conformist with a wizard-like prescence, accompanying himself on the harmonium. The event kindled a flame that was to ignite the underground in the UK. 'Who Be Kind To' was written especially for this reading. He continued to write poetry and publish work. For a long time he refused to take money for his readings, believing that poetry should be free. In January 1967 he and Timothy Leary chanted mantras at the Human Be-In at the Golden Gate Park, Haight-Ashbury, San Francisco in front of 30,000 people at the 'Gathering of the Tribes'. In London later the same year, the Summer of Love, a policeman stopped him from chanting at The Legalise Pot Rally in Hyde Park because it was 'against park by-laws'. He became a major spokesman for the anti-Vietnam war campaigns - signing the non-draft document in 1967 and protesting at anti-war rallies in Washington and New York. Though he was arrested several times in America on account of his pro-drugs and anti-war campaigns he was never held for long. During the riots in Chicago in 1968 Ginsberg halted police and national gaurdsmen in Lincoln Park by repeating the mantra ' Om ' over and over again for seven hours. He had become as busy as a professional politician, almost an alternative president. All over America he gave countless poetry readings and held 'office hours' at universities. He began to practice Buddhism in the 70's becoming a student of Chogyam Trungpa Rinpoche which alienated some of his friends in the process but which he remained adherent to. His book 'Fall of America' won the National Book Award in 1972. He took up music and photography, recording with well-known musicians and exhibiting at various galleries. He taught at Brooklyn College, New York and at the Buddhist college, the Naropa Institute and the Jack Kerouac School of Disembodied Poetics, which he set up with Anne Waldman, at the Institute. For the last twenty years of his life Allen Ginsberg devoted much of his time to the Naropa Institute in Colorado, teaching poetry. He gave large proportions of his money to a charity he set up in aid of struggling poets and continued to help his friends careers. He had moved from passionate rebel to a conscientious teacher. He also supported the North American Man Boy Love Association. 'At last' he declared with glee, 'I've found an organisation which is totally indefensible'. He lived modestly in New York, in the East Village, on 12th street, a run-down area very rarely spending money on himself. This the place that he called home. Latterley he belittled his own poetry, claiming that he had copied it from Kerouac, particularly from Visions of Cody, a novel full of prose poetry which he had read in manuscript in 1951, but had not been published until after Kerouac's death in 1969. Most critics were were quick to agree with Ginsberg's dismissal of his work. Nevertheless he introduced a large public to poetry that was written to be read aloud. He was the original beat poet and the chief guru of the hippie drug and protest movement in America during the 1960's. His work has now become mainstream. It is found on university syllabuses all over the world. Although he was a true original he managed to create a style so much imitated that it became a cliche. He opened up and sustained the confluence of transatlantic notations, protests, prophecies heterodox musics and minstrelsy streaming between writers, readers, performers and auditors throughout the last four decades. And if he encouraged the talentless to imagine that poetry was merely a question of spewing out 'feelings' he also inspired established poets. He published 40 books in his life. He died aged 70 in New York on 5 April 1997. Sources: The Times, The Gaurdian, The Independent, Reuters, The New York Times, Key-Z Productions, Electronic Poetry Center, University of Illinois (MH, LH, SR, EW).